Trigger Alert – this blog contains info re suicide which may be unsettling for some people. Click to enlarge. To keep the data handy, save the image to your phone. Suicide is a complex matter that does not lend itself to easy understanding or simple solutions. However, something we know about health professionals is that they know that there are mental health services and supports. Health professionals know that these services can be accessed by people who who are feeling suicidal. The data suggests that health professionals have an actual or perceived barrier to accessing these existing supports. I wonder what that barrier is. 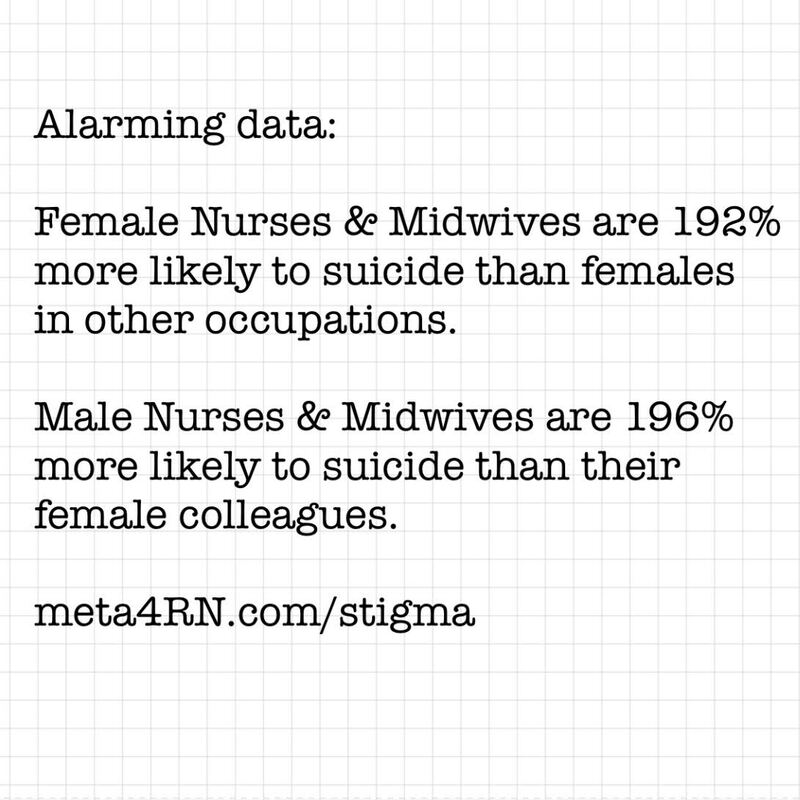 Could it be that nurses, midwives and medical professionals suicide at a greater rate than the other occupations because of actual or perceived stigma? We have the peculiar privilege of providing care for strangers who are/have been suicidal, but perhaps we aren’t so good at extending that nurturing care to ourselves and each other. Hopefully, sometime down the track, the data will result in targeted support for the prevention of suicide by health professionals. However, we need not wait for our political masters, health bureaucracies and professional organisations before we walk-the-walk and talk-the-talk of fighting stigma. If we see mental health/suicide stigma we should address it on the spot. 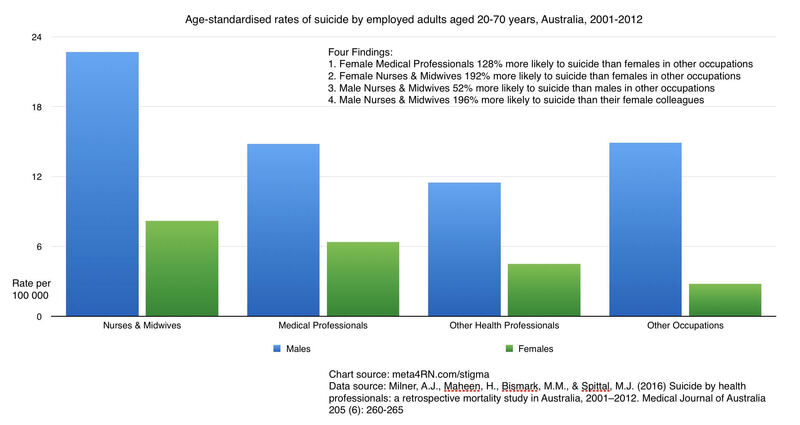 In the words of Lieutenant General David Morrison, “The standard you walk past, is the standard you accept.” As the data shows, it is dangerous for nurses, midwives, medical professionals and other health professionals to accept stigma. Outside of Australia and not sure where to get support? Google usually displays a red telephone icon and your country’s suicide support phone number when searching for a suicide-related topic. That’s it. As always your comments are welcome in the section below. 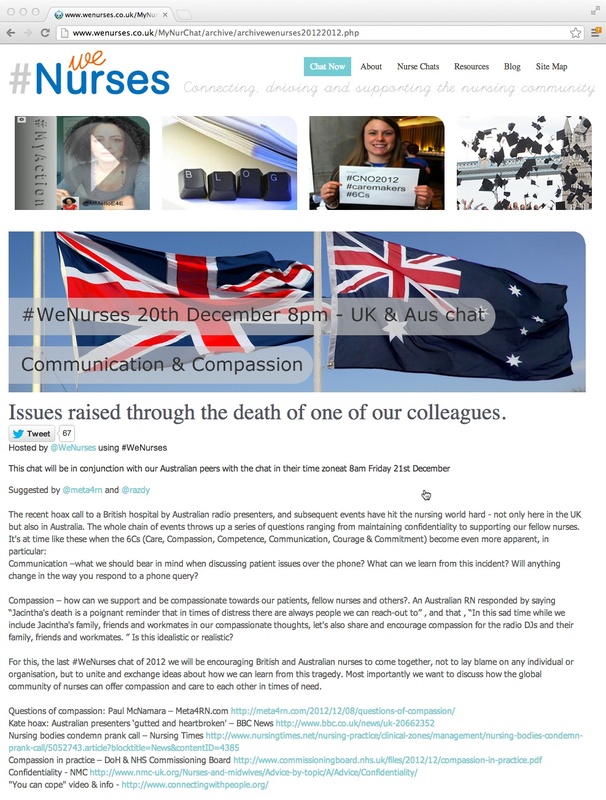 This entry was posted in Blog and tagged clinical supervision, emotional intelligence, hospital, nurse, nurses, nursing, secondary trauma, stigma, suicide on 26 September 2016 by Paul McNamara. This week I made a discovery. Just in the way Captain Cook “discovered” Australia, my “discovery” isn’t new to everyone. It’s just new to me. While standing at a bank of lifts in the hospital I noticed that when an elevator arrived and was going up it would ding once, and ding twice when going down. Hashtag observation. I was more excited by this than a grown-up should be. As I made my way through the hospital, I tested the other bank of lifts in Block D, then the lifts in Block C, Block B and Block A. Hashtag curious. That’s science baby: make an observation, come up with a hypothesis, then repeatedly test it to see if holds true. As it happens, all of the hospital lifts beep once if they’re going up and beep twice if they’re going down. Sample size: 1 hospital, 5 banks of lifts. Hashtag sciency. Naturally, I tweeted and facebooked about it. Hashtag share the love. It seems that the one-up two-down audible alarm holds true unless the lifts/buildings are old and/or have lifts which do not announce their arrival with an audible sound at all. Hashtag stealthy. Question 1: What else is happening right in front of me that I’m not noticing? Question 2: What other secret tips and tricks do vision-impaired people have that they’re not telling us? Hypothesis: Even when the big stuff isn’t going all that well, there’s joy to be had in the small stuff. Do the lifts/elevators in your hospital/office/apartment beep once on the way up and twice on the way down? I’m keen to hear from you comments/responses are welcome in the space below. This entry was posted in Blog and tagged audible, beep, ding, elevators, geeky stuff, hospital, lifts, once, twice, vision impaired on 14 November 2015 by Paul McNamara. Some days it feels like a cruel conspiracy. Those are the days when it feels like the time and space I have made to speak one-to-one to the patient* is in the middle of a sports arena. The patient and I walk into the middle of the empty playing surface and make our preparations for meaningful discussion, for emotional catharsis, for education, for counselling, for disclosure, for discovery, for therapy. Then the grandstands of the arena start filling with people with loud voices. These people are not providing frontline care, so we would like to think of them as supporters. However, they all seem to think of themselves as coaches. They each have their own special area(s) of interest and shout well-meaning advice from their seats in the grandstand. It gets very rowdy and distracting. So many supporters coaches. So many systems**. Systems are what makes airlines so safe – apparently that’s why hospitals have become so system-focused over the last couple of decades. I think it is a bit silly that public health systems try so hard to align themselves with profit-making airline systems. The cost of a regional hospital redevelopment ($454m) is about the same cost as two Boeing 787s (source), However, they serve very different purposes: the hospital is filled with critically ill people aiming to become less unwell or die with dignity. Commercial jets are filled with tourists and business people going on a planned journey. 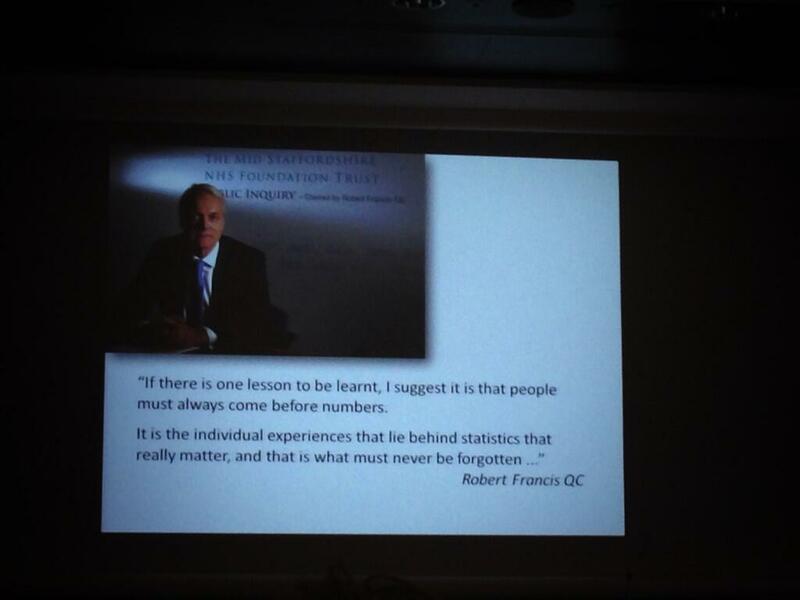 The hospital is a place of unknowns: discovery, diagnosis, treatment, trials and strong, unpredictable human emotions. A commercial jet is a trumped-up bus that travels at a scheduled time on a scheduled route between clearly defined destinations, carrying only people who are wealthy and healthy enough to travel long distances. Hospitals and airlines have such very different clients, expectations, control and outcomes – can they really teach-each other much about systems? Nevertheless, I understand the rationale for systems, and will make no effort to argue against them. Still, wouldn’t it be nice if there was one healthcare system? As it stands in my workplace, the emergency department has a system (EDIS) that does not speak to the ICU system (MetaVision), which does not speak to the general hospital system (ieMR), which does not speak to the mental health system (CIMHA). And that’s just within one hospital – imagine how fragmented it gets when we start thinking of the primary healthcare and rural/remote outpatient sectors. I understand that some of these systems, some of these competing demands, are very important – but not all of them are. For example, it is not important that a clinician spend time away from their patients to transpose a bit of information that is in one hospital system into another hospital system – this is a matter of dumb systems. Which is why nurses and other clinicians know that sometimes the safest, most compassionate, and most ethical thing to do is to turn their back on the distractions created by dozens of disjointed systems, and make the priority to simply be with the patient. Why? 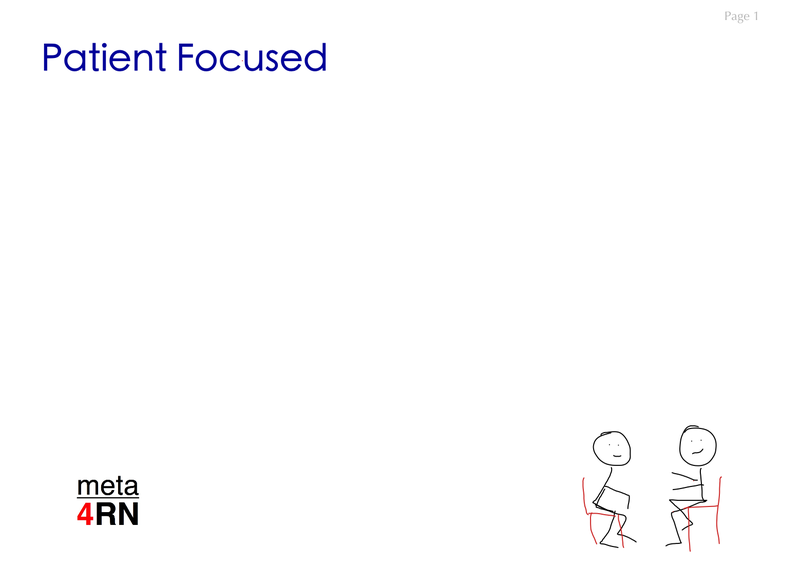 Because we are trying to stay focused – patient focused. In mental health over the last couple of decades nomenclature has changed from “patient” to “client” to “consumer” or “service user”. I understand the rationale for this – it is to move away from the passive (i.e. : “patient” as someone that the “expert” diagnoses and fixes) to participant (i.e. : “informed “consumer” of a service). In my current role I provide mental health assessment, support and education in a general hospital – the people I see are, in this context, first-and-foremost medical/surgical/obsetric hospital inpatients. It is these people’s physical health that had them admitted to an acute general hospital as “patients”, hence my use the word here. 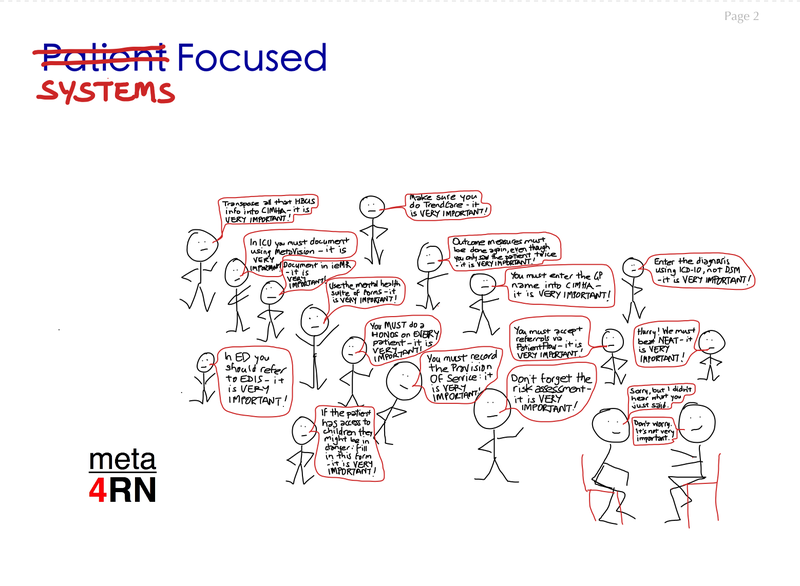 **All the systems named in the “Systems Focused” cartoon are real, as is the claim that using each one is VERY IMPORTANT. I used an easy-to-use iPad app called Notes Plus to draw the cartoons. As you can see, my artistic skills have pretty-much plateaued since kindergarten, as has my spelling. Nevertheless, I think the cartoon might have been a little better and a lot easier to draw if I had used a stylus – that’s what I would recommend if you plan to do something similar. As always, your thoughts/feedback is welcome in the comments section below. 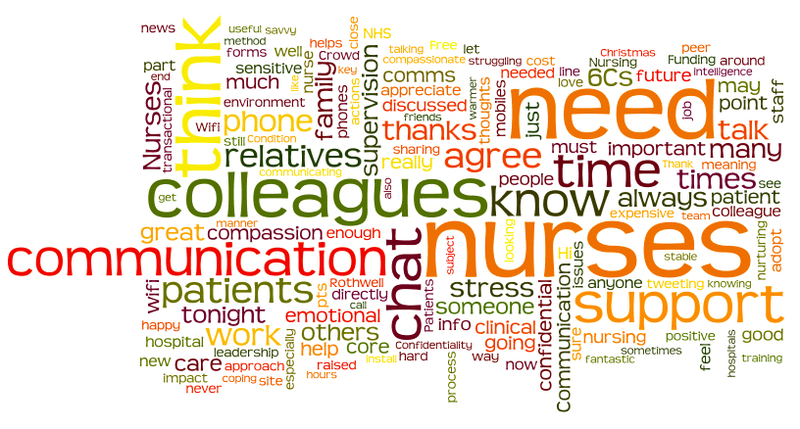 This entry was posted in Blog and tagged communication, consultation liaison, emotional intelligence, general hospital, hospital, mental health, nursing, nurturing on 6 April 2014 by Paul McNamara.